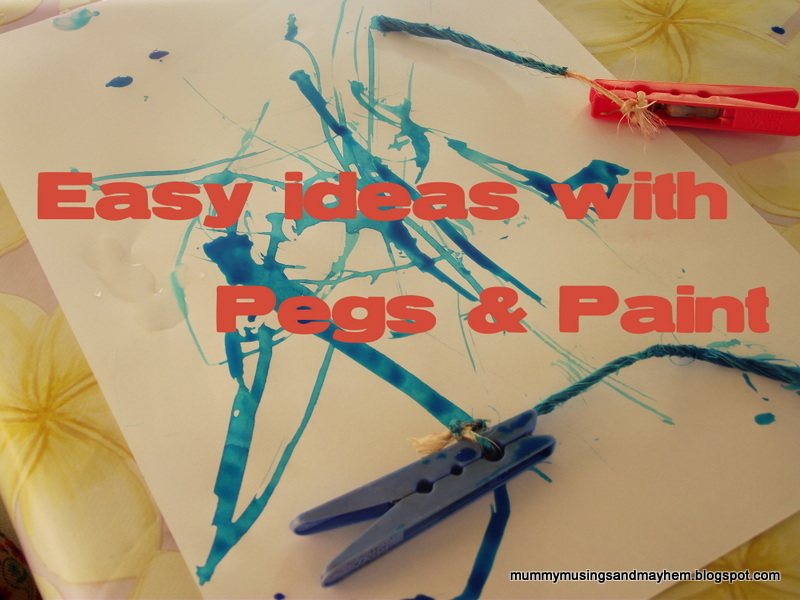 Learn with Play at Home: Pegs & Paint. 3 Easy and Fun ideas! Pegs & Paint. 3 Easy and Fun ideas! What a joy it is to be guest posting on Learn with Play at Home! I always love to visit this space and be inspired by Deb and her huge variety of fun, child focused activities that anyone can try at home, so I am very excited to be able to share a post here with you! I'm Jode from Mummy Musings and Mayhem and I am currently stay at home Mum to my twin 2 yr old toddlers and a teenager...we are indeed busy around here but I enjoy delving back into the creativity of my childcare teacher days and preparing fun yet easy toddler activities for my 'toddler twosome'. Blogging about our family adventures (and yes sometimes stresses!) as well as the fun activities we do has become my favourite hobby and a way of holding onto those cherished early years of childhood! We are on a tight budget with me not working at the moment so i really enjoy trying to find ways of presenting creative fun using simple items from around the home or $2 shop! Fun doesn't need to be expensive...it's often messy at our place though! One of my favourite painting and creative 'tools' to use with my toddler twosome is the humble peg. It makes a fantastic little handle for those chubby , still a little uncoordinated toddler hands and grips. As easy as it sounds (I love easy with younger toddlers! )....just tie a short length of string onto pegs....you will find it an easier activity for little hands if you use fairly coarse string or twine. Remember to tie securely or you will have some tears when they don't come back out of the paint! The toddler twosome loved wiping the string back and forth but older children who have more fine motor control will also enjoy making more intricate patterns . Depending on what colours you use you can also talk about the colours running together and forming new ones as well as making lines or dots on the paper. I like to tape down the paper to a table for younger toddlers as it stops the frustration of it sliding around and lets them concentrate on making their artworks instead! Don't you just love the concentration and experimenting here? You could also do this activity with acrylic paint but you may want to thin it a little with some water first. For older children you could try placing the paint in shallow containers to allow for a little more exploration and dexterity. So very easy! Just cut a few household sponges into thick strips, fold in half and peg! I used a little of our homemade Cornflour Paint mixed with edicol dye again...so the focus is on having fun with the activity rather than worrying about the mess. Cornflour paint washes out so easily and yet it is so easy and inexpensive to make! With 2 yr old toddlers who love to paint and be messy we use it a lot! Having the handle to use gives toddlers a little more fine motor muscle control and this helps with confidence and the willingness to try new activities......as you can see we used a few different sized and shaped sponges as well as our trusty paint tray to keep it all contained! Wrapping recycled fruit netting bags around a bath sponge also makes great prints on paper! Peg sponges are also handy as a blusher...although i don't recommend blue! They make fun patterns on the paper as well as being easy to clean up and reuse again for another day! Exactly as the name suggests! I brought a large pack of latex make up sponges at our local $2 shop...soaked them in a little water for 10 minutes and then pegged them! Add some water paint, paper towelling and recycled meat trays and you have another toddler friendly activity for little cost! You can of course just use paper but we had trays to use and i liked the patterns the texture of the sponges made on the waxy surface of the trays. Whenever i use water paint inside i always like to lay down a little paper towel as it soaks up the paint nicely and at the same time makes some great patterns! Again a good activity for practising that pincer grip and fine motor control. During this activity we also talked about the colours and different textures the girls were experiencing. The paint looked different on the trays compared to the towel...why? Tara had great fun matching the peg sponge to the right colour paint and got very upset when Ruby didn't do the same! I just love the differences between my twins...makes activities all the more interesting i think as they always approach creativity in very different ways and often i am the one to learn something new! Ruby loves to try and figure out how to get the sponges off of the pegs....fantastic for her critical thinking and problem solving skills as well as practising her eye hand coordination!Of course then Mummy has to put them all back on or there are tears but a small price to pay for some easy fun on a budget and busy little bodies! I hope i have inspired you to use those pegs for something other than hanging out the washing....they really are great little tools for fun and learning! We'd love to have you drop by for a visit! Thanks again to Deb for having us stop by and share some of our messy fun with you today! What wonderful ways to paint. Pegs with string would make wonderful worm paintings.